“If there is one book teens and parents (and everyone else) should read this year, Out of My Mind should be it” (Denver Post).Melody is not like most people. She cannot walk or talk, but she has a photographic memory; she can remember every detail of everything she has ever experienced. She is smarter than most of the adults who try to diagnose her and smarter than her classmates in her integrated classroom—the very same classmates who dismiss her as mentally challenged, because she cannot tell them otherwise. But Melody refuses to be defined by cerebral palsy. And she’s determined to let everyone know it…somehow. In this breakthrough story—reminiscent of The Diving Bell and the Butterfly—from multiple Coretta Scott King Award-winner Sharon Draper, readers will come to know a brilliant mind and a brave spirit who will change forever how they look at anyone with a disability. 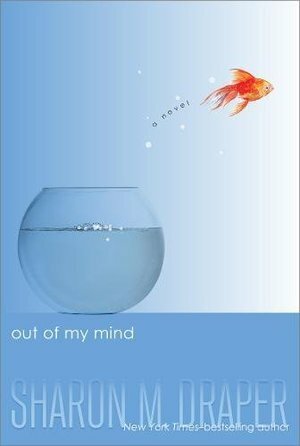 Out of my mind, written by Sharon M. Draper, is about a 12-year-old girl named Melody. Melody is a very bright girl with a photographic memory. They say her mind is like a “video camera that never stops recording.” The one trouble Melody must face everyday is that she has cerebral palsy, a disease where she is unable to move, write, or talk. Unfortunately this means that Melody’s thoughts are all trapped inside her head and she is unable to let them out. That is very frustrating for Melody (as it would be for anyone) and this frustration turns into her “tornado attacks”. This book is about Melody and her everyday struggles with her disease, as well as with her family and getting used to her new life with her new baby sister. I enjoyed reading this book because not only did it teach me about cerebral palsy, a disease I did not know a lot about, it also was a great read and a book that always kept me engaged and interested. I think this is great book for adolescents because it teaches children about being different and about other kids around them who may have a disability. It is important to teach children that it is okay to be different and everyone is smart and special in their own way. Beautiful story about struggle and accomplishment through the eyes and mind of a young girl with cerebral palsy. This novel may sound depressing at first, but it is about a girl who is overwhelmed with happiness from the love of her family, her neighbor, and her aids at her school. The girl, Melody, sees the preciousness of life and the book reminds the reader to put their life into perspective. It doesn't make you feel guilty for being able-bodied, but reminds you to appreciate the little things in your life that you may not think about. This is a great coming-of-age story for any reader around third grade or older. There is the struggles of any child going through elementary school and trying to figure out where they fit in the world. I would recommend this as an independent reading book for students who are interested in a story with more substance and life lessons. I might use this for a classroom reading for older grades. I think that a lot of lessons can be taught through it, realizations made from it, and information to be attained through the story itself and the way it's written. After reading this book I learned that as a teacher it is extremely important to encourage all of our students and to see the best in every child. In the book Out of my Mind the author writes about an eleven-year-old girl named Melody who has cerebral palsy. Melody cannot speak because of her disability, and because of this many people believe that she is not capable of normal activities. However, once Melody receives a computer device she shows everyone that not only does she have thoughts, but also she is brilliant. As a future teacher it was upsetting to read about how other teachers treated Melody. For example, when she was in the special education class one of her teachers insisted on playing nursery rhyme songs and teaching the alphabet even though Melody is in the fifth grade. I think this book is great for teachers to read because it teaches all of the readers that you should always support and motivate all students. Reading this book assured me that inclusion in the classroom is the best thing educators can do for those with disabilities. When Melody was placed into a music class she became so excited to get to sit with her peers. Melody was also able to meet a friend, Rose, and because of this Melody would get very excited for that class. Although inclusion had its difficulties, this is what allowed Melody to show her true potential. Because inclusion in the classroom is something that occurs in schools, I think that having students read this book will allow them to gain a better understanding as to why it is important for those with disabilities to be in the classroom. I also think that this book will allow students to see how a disability may cause difficulties for a person, but it is not the only thing that defines them. By reading this book students will be able to see that Melody is smart, she enjoys country music, she likes to make sarcastic jokes, and she loves McDonalds. This book can make students realize that they can relate to those with disabilities because a disability is not the only thing that defines a person. I think the book Out of my Mind is a great source for upper elementary students to read in order to learn about how to treat their peers. This book really gives readers an insight on how hurtful words can be and how difficult everyday activities are for those who have disabilities. Although this story line is based off of a child with cerebral palsy, I think it can be generalized to all students with disabilities. This book teaches students that being friendly and helpful to others can make a huge difference in someone’s attitudes towards school. I think that this book would be a great piece of literature to incorporate into book clubs for fourth and fifth grade students because there are so many different discussions students can have. I think that the best way to teach this book to a class is to have open discussions where students can talk about the importance of inclusion in the classroom, how bullying can affect others, how having one person who believes in you can make a difference, and the importance of having courage and never giving up. This book teaches valuable lessons that are useful for students as well as adults.